Picture: Major Dead after assuming the post of Boot Camp Commandant. 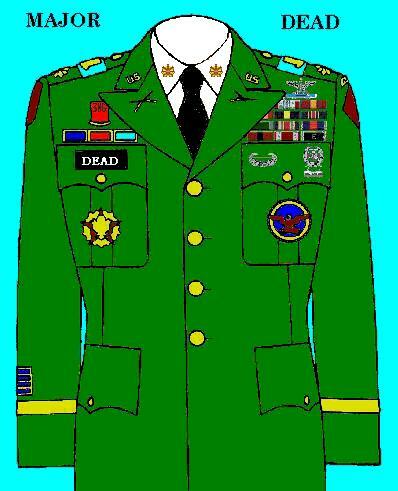 Major Dead started out as a member of the 3rd Naval Group on 14 December 2001. He entered at the rank of Lieutenant Colonel with the assignment as Executive Officer of 3NG's failed CFS2 Wing. Once transferred to the Marine Wing, he assumed command of the 2nd Squad, Marine Support Wing ancestor of today's "Death Angels" Squadron. He was promoted to Colonel and served as CO of 2nd Squadron until after his promotion to Brigadier General in March of 2002. On April 4th 2002, Brigadier General Dead resigned from 3NG for a try at solo flying in CFS2. He returned to 3NG on May 1, 2002 at the rank of Ensign in the Naval Wing. After promotion to Lieutenant J.G. he assumed post of Intelligence Officer in the Naval Wing. At this time he transferred to the newly formed Bomber Wing as Operations Officer and given the rank of 1st Lieutenant and then Captain. On 17 July he was in a horrific car accident from which he had a long recovery. Upon his return from a 20 day Hospital stay he re-assumed his post of OPS Officer at the rank of Major which he held until the closing of the Bomber Wing. With this Major Dead returned to his true home, the Marine Wing. He assumed the duties of Boot Camp Commandant which he continues to this day.